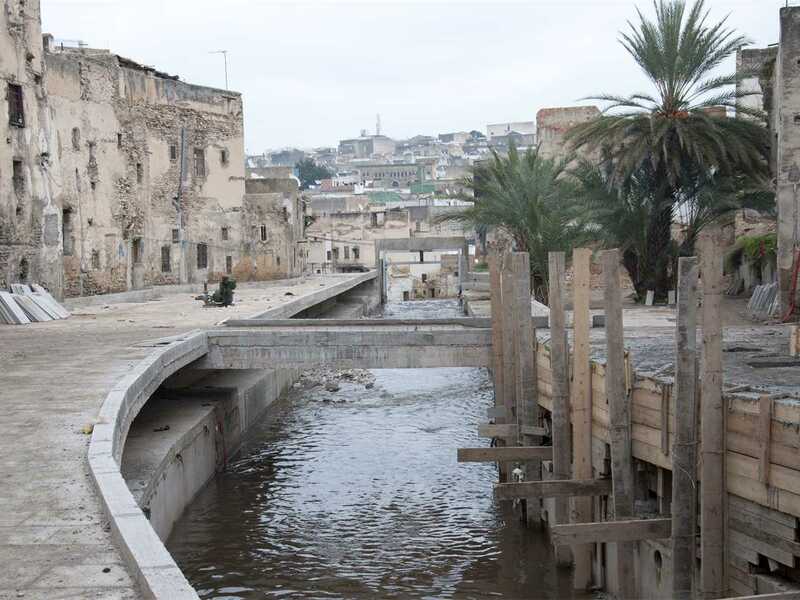 The project will stop the Fez River from being polluted by sewage overflow and will allow the river to regain its potential as a public amenity. The “el-Rcif Plaza” was previously cluttered with buses, taxis and informal parking – but is now a core of the pedestrian network. The “el-Rcif Plaza” melds the transportation hub and the river bank circulation system. 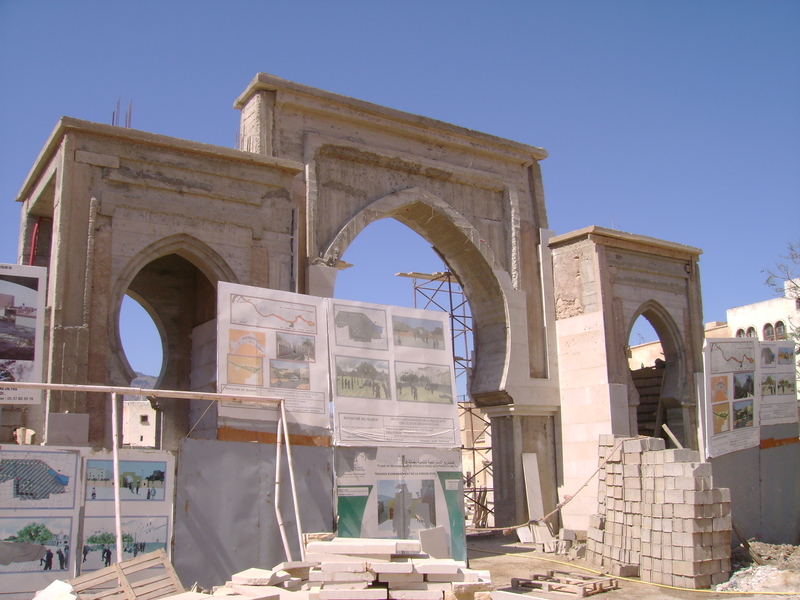 The archway marks the entry to the “el-Rcif Plaza”, now a core of the pedestrian network. 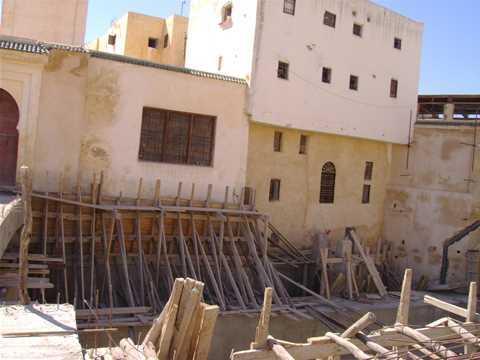 Adjacent buildings and their foundations are fragile and several centuries old. 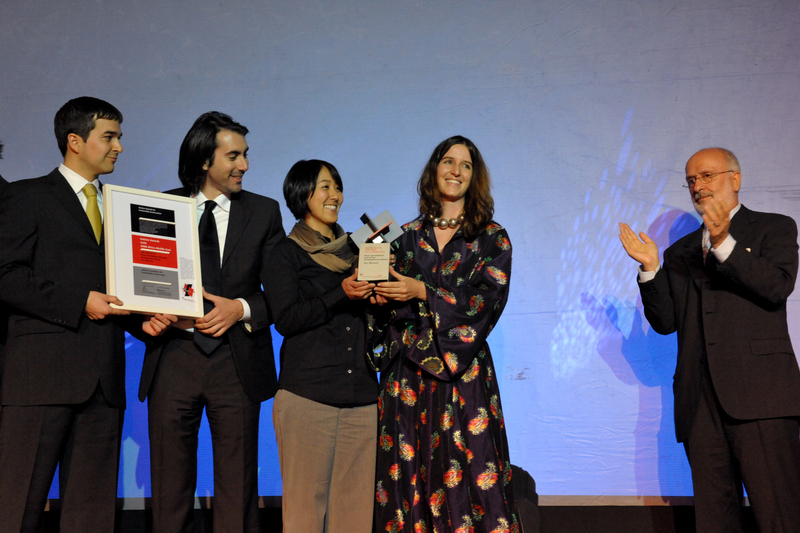 Winners of the Global Holcim Awards Gold 2009 prize (l-r), Takako Tajima, urban planner and co-founder, and Aziza Chaouni, architect and co-founder, Bureau EAST, Morocco/Canada/USA congratulated by Markus Akermann, Chairman of the Management Board of the Holcim Foundation and CEO of Holcim Ltd, Switzerland. 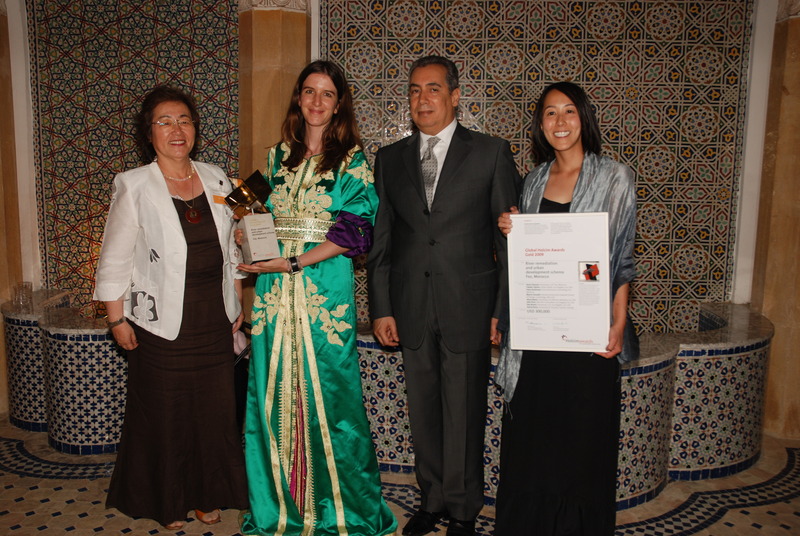 Congratulating the winners of the Global Holcim Awards Gold prize 2009 (l-r): Haruko Hirose, Special and Plenipotentiary Ambassador of Japan to Rabat; prize-winner Aziza Chaouni, architect and co-founder, Bureau EAST, Morocco/Canada/USA; Mohammed Gharrabi, Wali of Fez-Bouleman, Morocco; and prize-winner Takako Tajima, urban planner and co-founder, Bureau EAST, Morocco/Canada/USA. 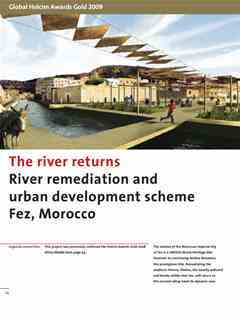 A comprehensive approach for the river Fez to run free and clean again. 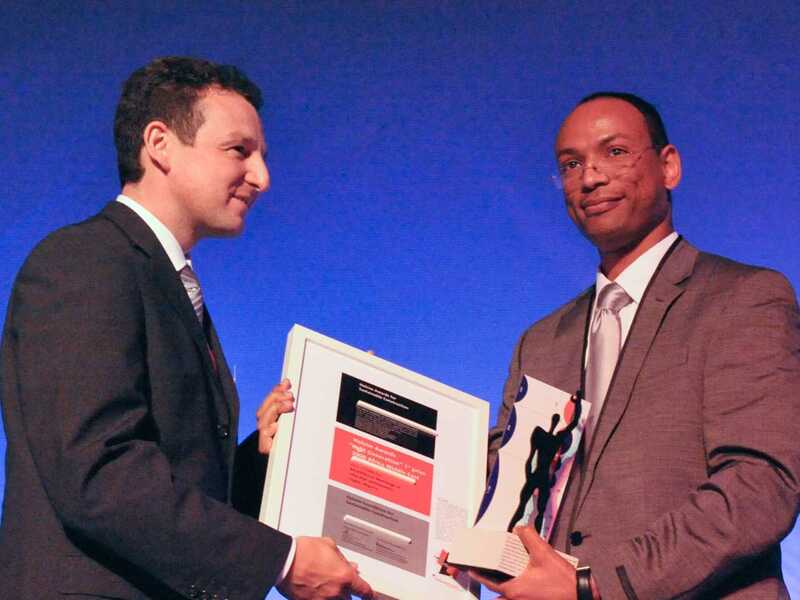 Resuscitation timeline and the new economic model. 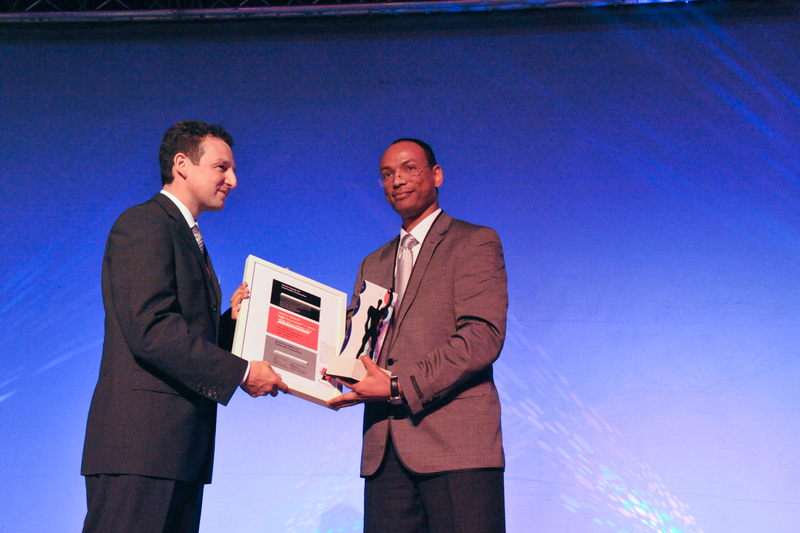 Master plan for regional water quality improvement. Procedures for new public spaces in the Medina of Fez. Sebou River watershed and water quality. 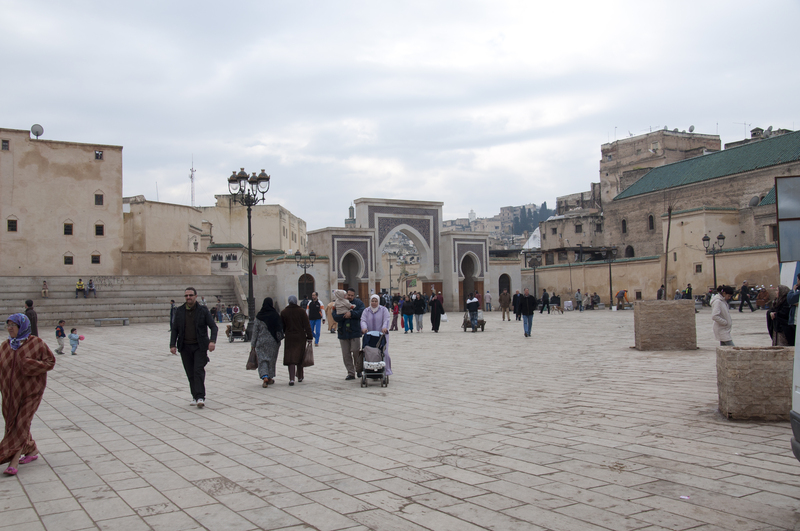 The medina of the Moroccan royal city of Fez is a UNESCO World Heritage Site. 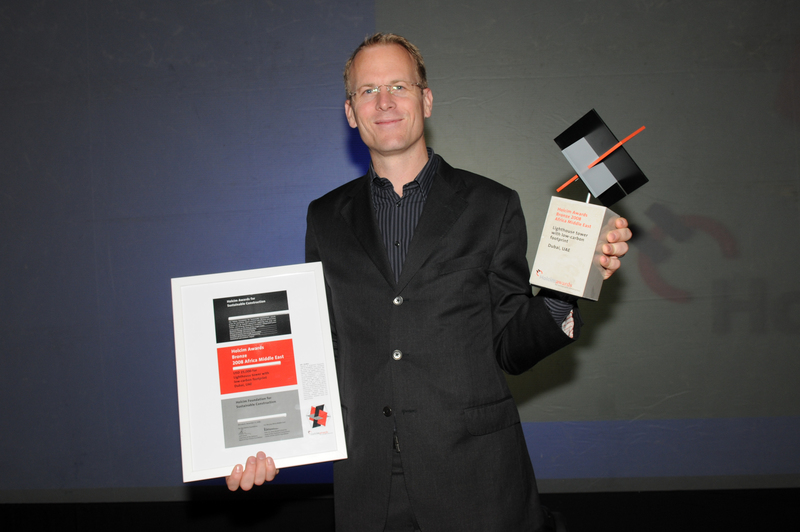 However its continuing decline threatens this prestigious title. 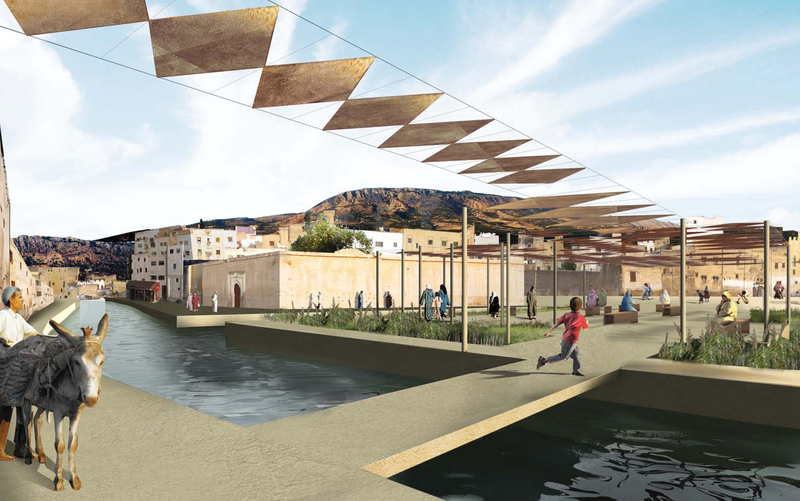 The project, River remediation and urban development scheme, aims to revitalize the heavily polluted and neglected river Fez. 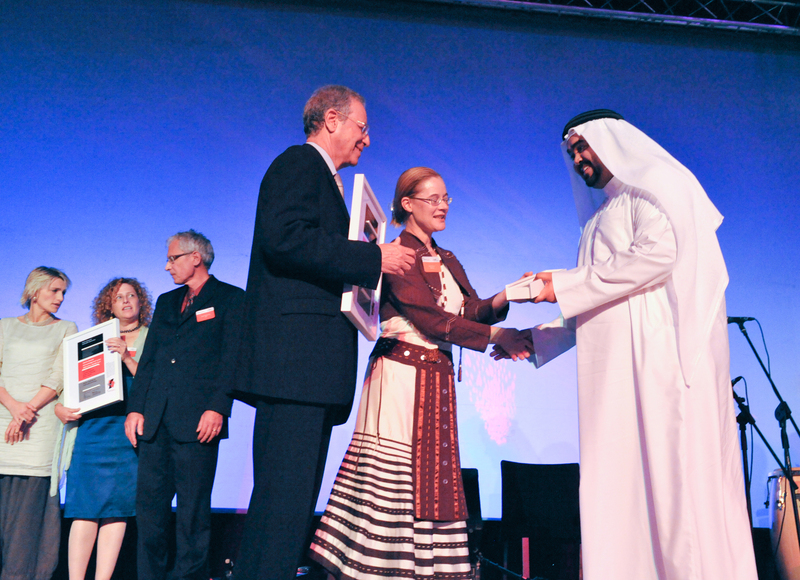 By returning to this ancient heart its dynamic soul, urban renewal and life quality will follow. 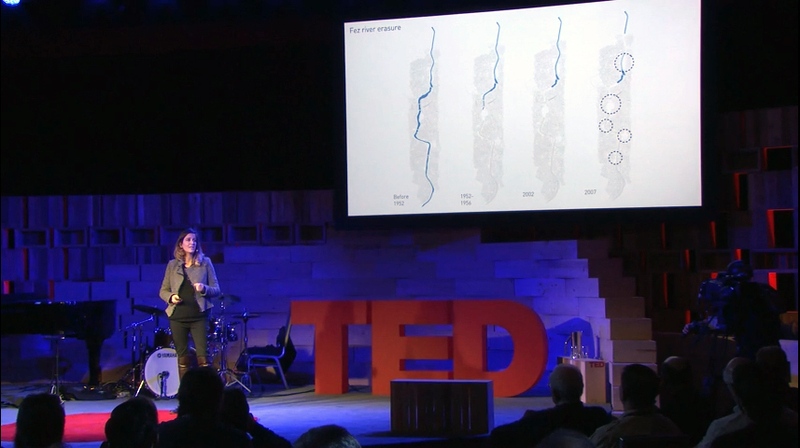 Architect Aziza Chaouni’s TED Talk on the progress of the Holcim Awards Gold-winning Fez River remediation and urban development scheme in Vancouver, Canada. 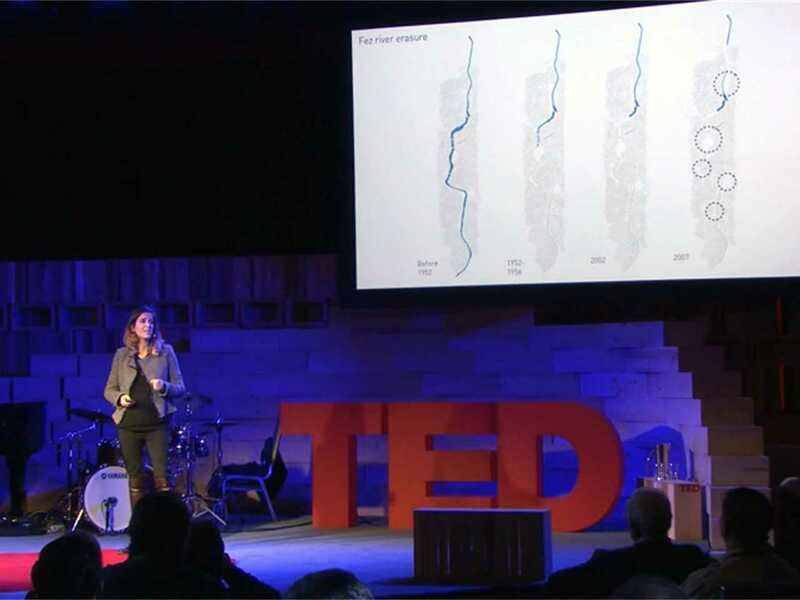 In March 2014, Aziza Chaouni presented a TED Talk in Vancouver that provides an update on the implementation of the Fez River remediation and urban development scheme. In the 6-minute presentation, she explains how the UNESCO World Heritage Site is being remediated following the city’s diversion of untreated sewage and industrial runoff from the river for treatment. 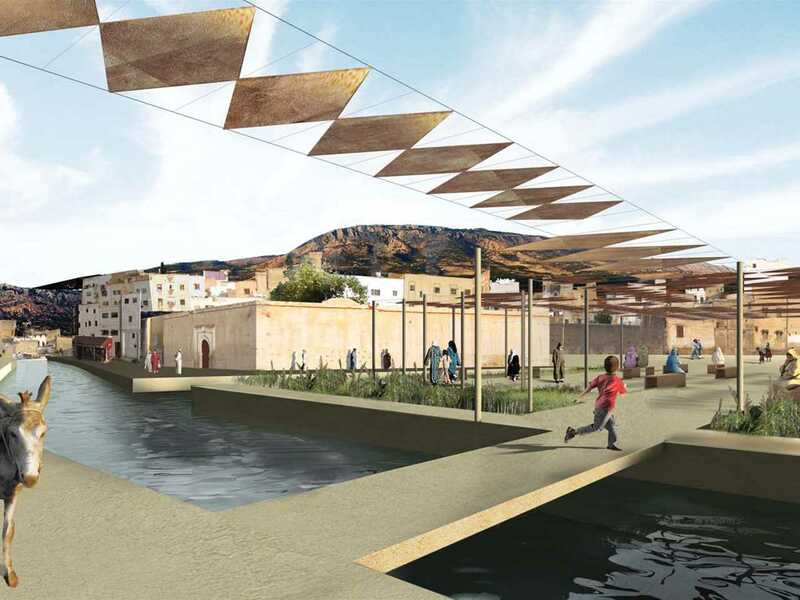 The project converts riverbanks into pedestrian pathways, connects these pathways back to the city fabric, and finally converts the urban voids along the riverbanks into public spaces that are lacking in the Medina of Fez. Two of the main areas of remediation have been the Rcif Plaza, and an urban void along the river banks. Rcif Plaza sits on top of the river has been remediated into an entirely pedestrian zone, covered with recycled leather canopies, and connected it to the banks of the river. 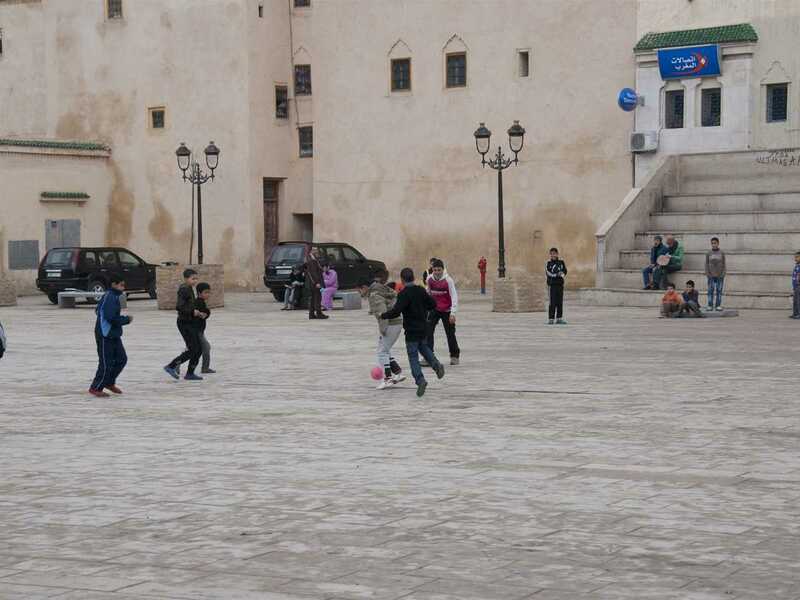 The second site of intervention is also an urban void along the river banks that was formerly an illegal parking space that is to be transformed into the first playground in the medina. 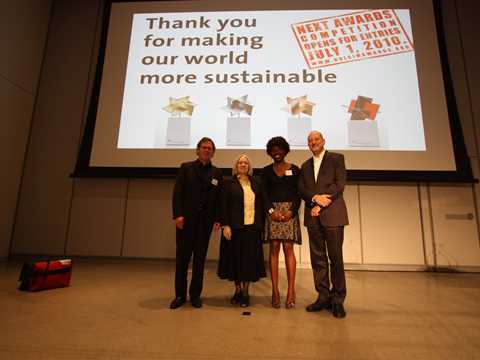 The playground is constructed using recycled tires and also is coupled with a constructed wetland that not only cleans the water of the river but also retains it when floods occur. 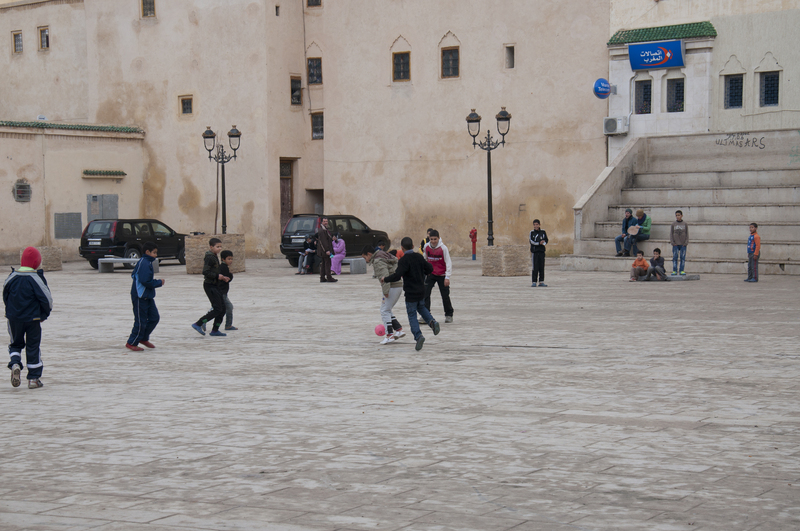 Project update 2013 - "River remediation and urban development scheme, Fez, Morocco": The square has come to life with families and people of all ages playing football, chatting or simply sitting on the amphitheater-style seating, people watching. 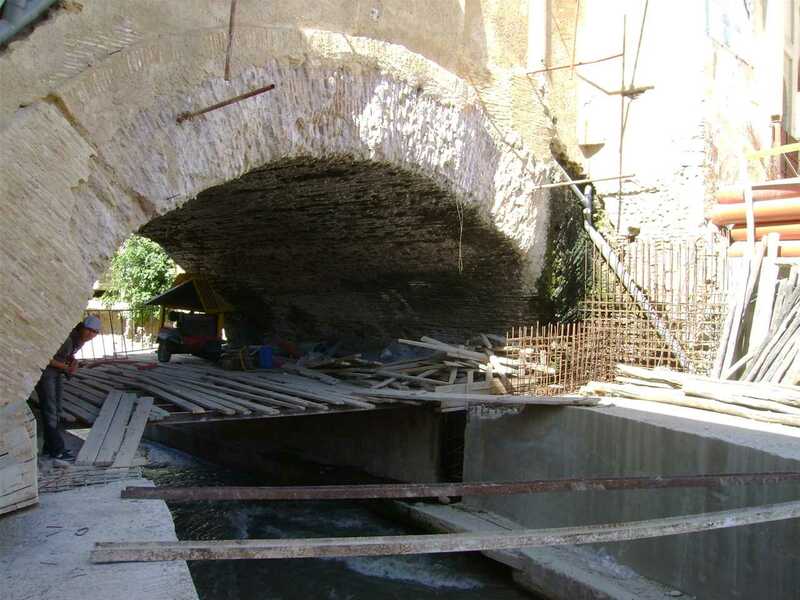 Project update 2013 - "River remediation and urban development scheme, Fez, Morocco": The river that had been covered by concrete culverts has been re-opened, creating a pleasant riparian zone for pedestrians on both sides of the waterway. 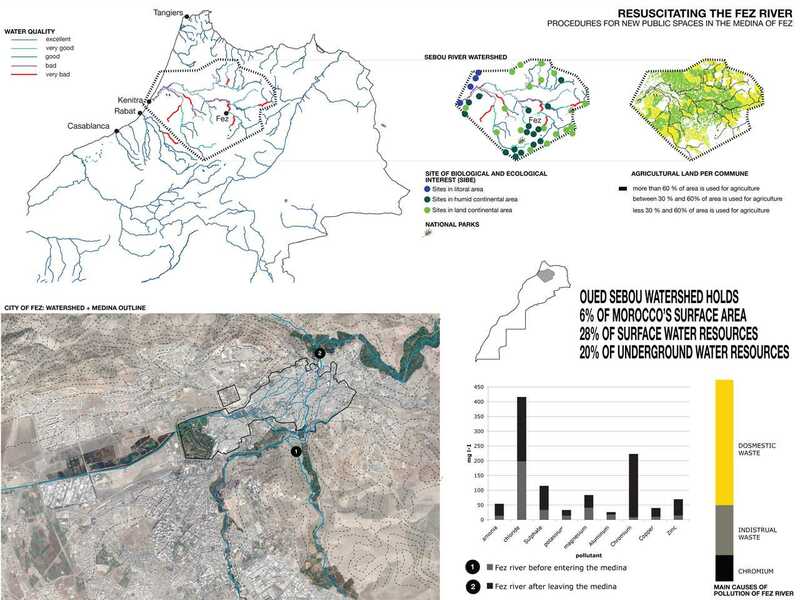 Project update 2013 - "River remediation and urban development scheme, Fez, Morocco": Sewage channels are covered to form additional public spaces. One of the three precincts of the prize-winning scheme is close to completion. 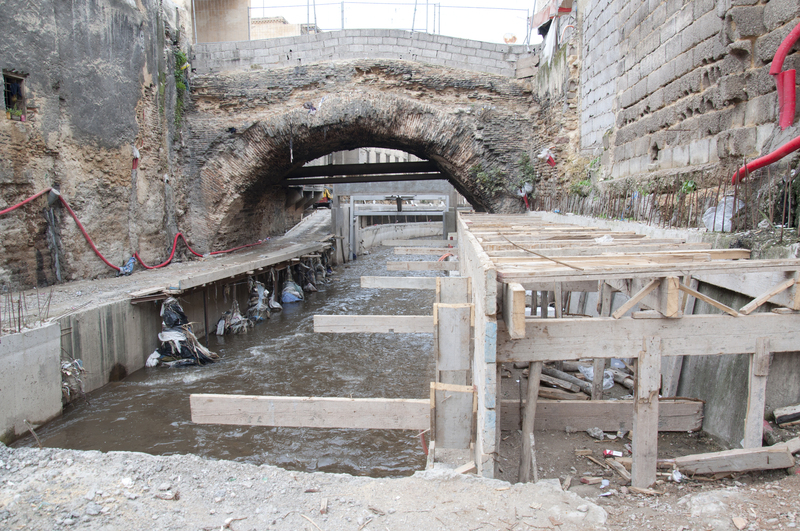 As the project is implemented, water quality in the River Fez has begun to be restored and the northern part of the river which was previously paved over with concrete slabs has been uncovered. 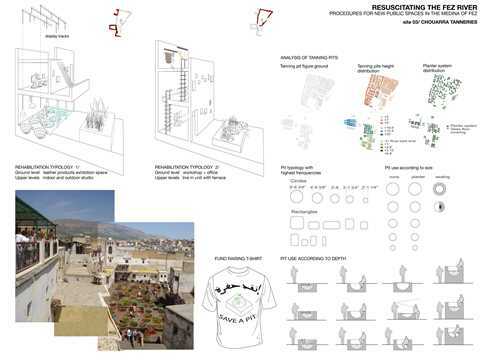 There has been ongoing progress at the site of the Global Holcim Awards Gold 2009 winning project in the UNESCO World Heritage listed old town of Fez, Morocco. 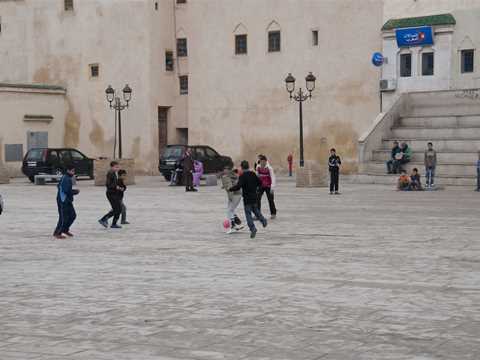 One of the three precincts of the prize-winning River remediation and urban development scheme has been completed in the Medina of the Moroccan imperial city. 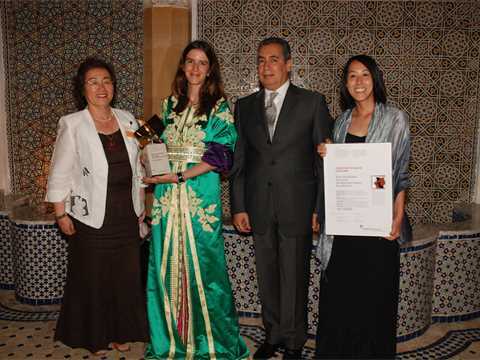 Aziza Chaouni and Takako Tajima, Principals of Bureau EAST were awarded the Global Holcim Awards Gold prize in 2009 with a multi-sited and multi-functional project that is centered upon the recovery of the river Fez. 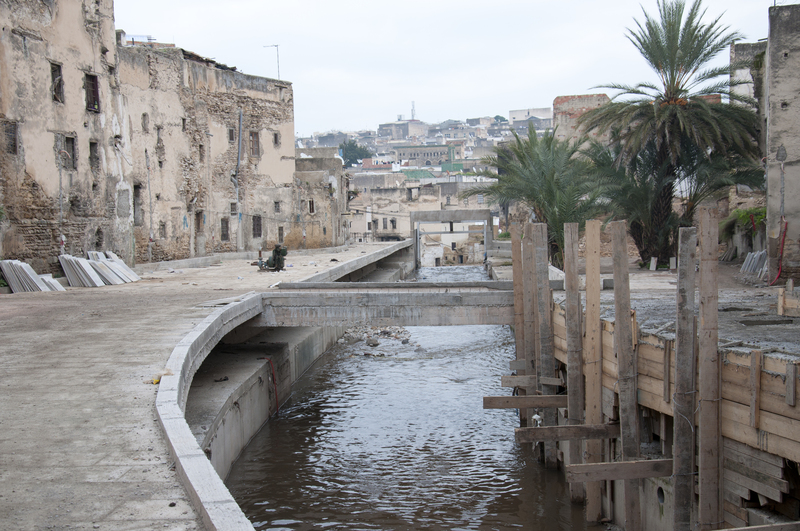 Work on restoration triggers a range of interventions in the Medina. One of the three precincts of the Award-winning project which will take advantage of vacant sites to reestablish a connection with the city fabric is close to completion. 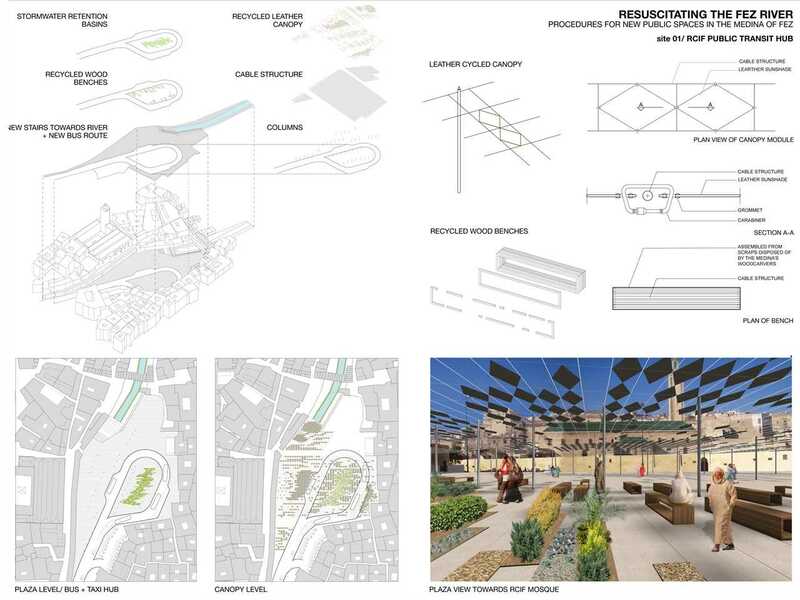 The “el-Rcif Plaza” melds the transportation hub and the river bank circulation system and allows for the cleaning of runoff water. The “el-Rcif Plaza” was previously cluttered with buses, taxis and informal parking – but is now a core of the pedestrian network. A larger parking facility has been constructed beyond the southern city walls of the Medina, and buses and taxis have been re-positioned. 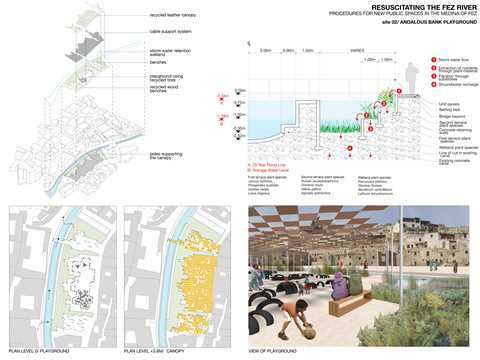 The next steps including urban furniture, canopies and benches, and rehabilitation of the river banks will mark the completion of the “el-Rcif Plaza” section of the project. The large open space is turning into a popular night-time meeting place. During the day the trees are still too small to provide reasonable shade in summer, but the square comes to life during the cooler months and in the evenings with families and people of all ages playing football, chatting or simply sitting on the amphitheater-style seating, people watching. The City of Fez Department of Water & Power (RADEEF) is implementing a new system that will channel the city’s water sewage towards two treatment plants. This will stop the Fez River from being polluted by sewage overflow and will allow the river to regain its potential as a public amenity. 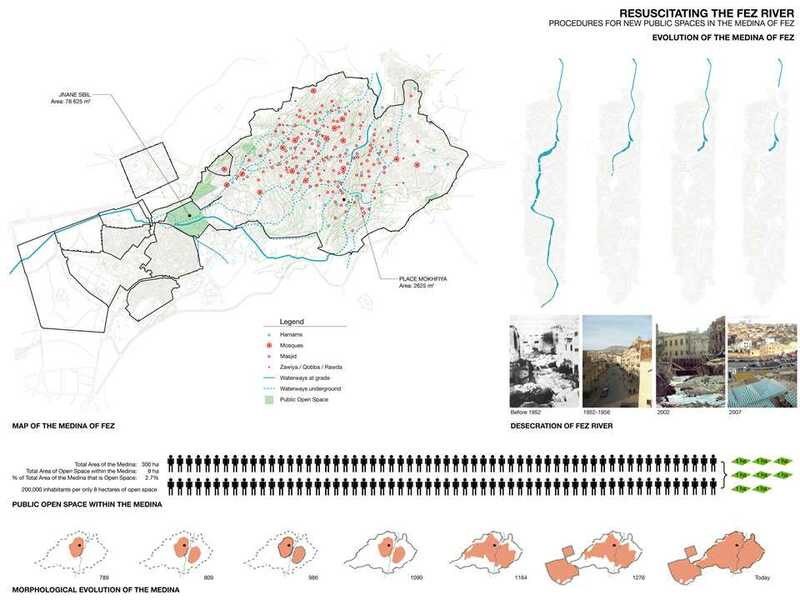 The rehabilitation plan for the river and acupunctural interventions along its banks within the medina will use a range of rehabilitation tactics that account for soil geomorphology, levels of water pollution, adjacent urban fabric and ecological systems. The revitalized system will include canal restorers, constructed wetlands, bank restoration and storm-water retention ponds. The river that had been covered by concrete culverts has been re-opened, creating a pleasant riparian zone for pedestrians on both sides of the waterway. Bridges have been restored and sewage channels are covered to form additional public spaces. 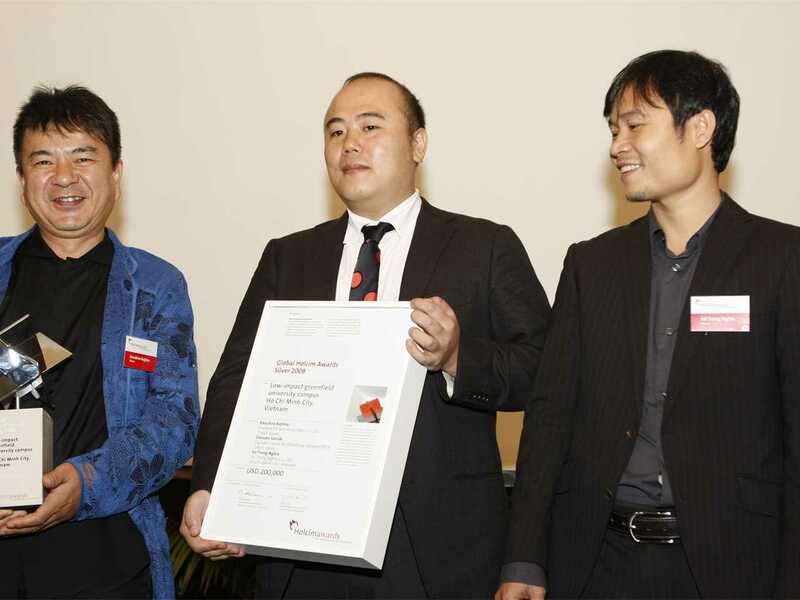 “The moment things changed was when we won two very important design prizes, called the Holcim Award for Sustainability in 2007. 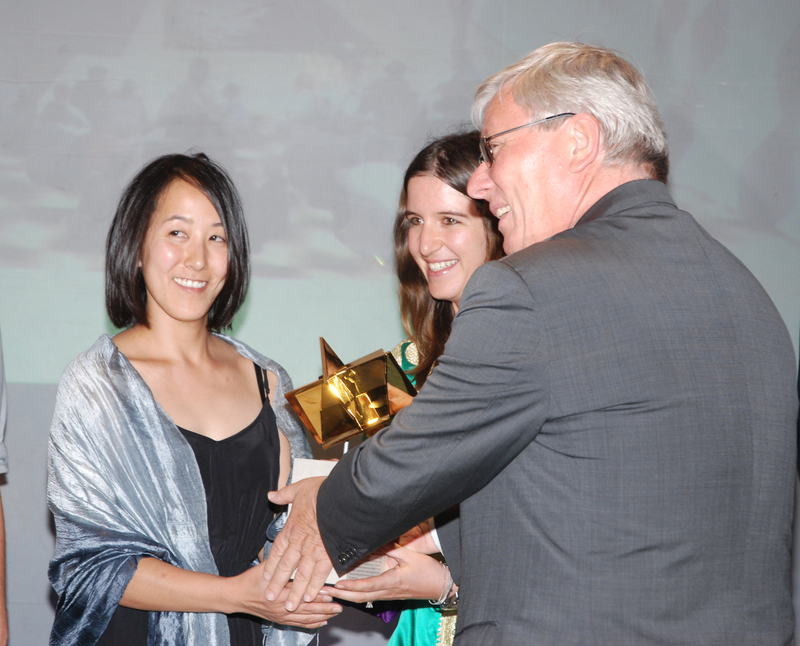 It’s one of the most lucrative prizes — up to USD 400,000 for the Gold Regional and Global awards — in the design field. 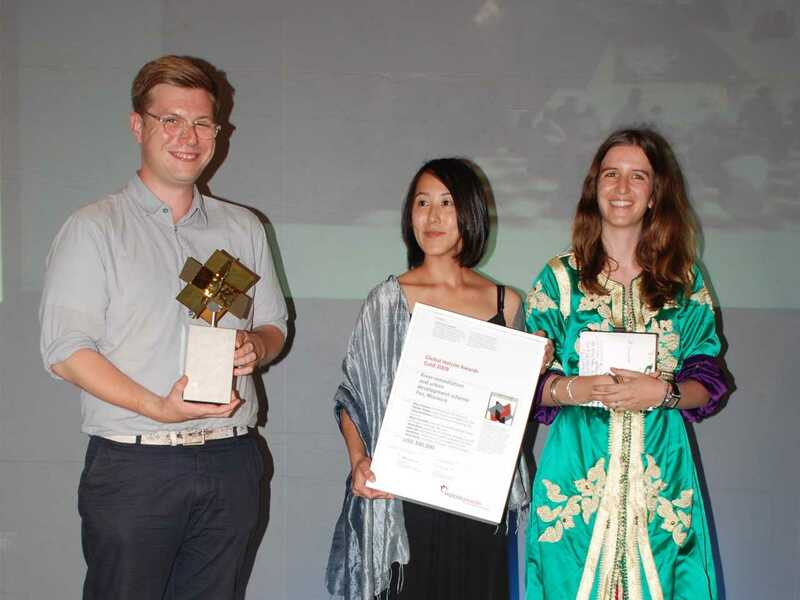 The prize brought the Fez River, its problems and potentials to the attention of a large public”, says architect and engineer, Aziza Chaouni. 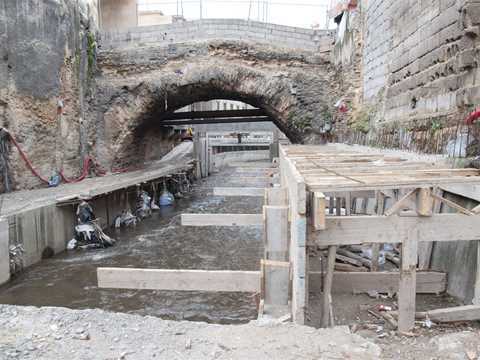 As the project is implemented, water quality in the River Fez has begun to be restored, and the northern part of the river which was previously paved over with concrete slabs has been uncovered. This was an extremely challenging task since the adjacent buildings and their foundations are fragile and several centuries old. 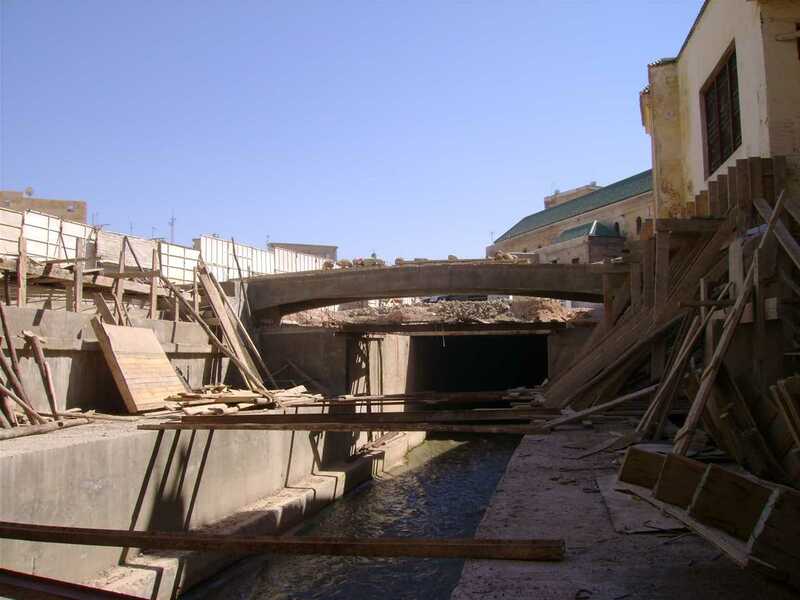 The sewage pipelines which previously emptied directly into the river have been diverted. The notoriety of the River Fez urban revitalization project and recognition through the Global Holcim Awards Gold 2009, an array of further initiatives under the auspices of UNESCO and various American NGOs have been launched – building on the positive impact of the project developed by Bureau EAST. 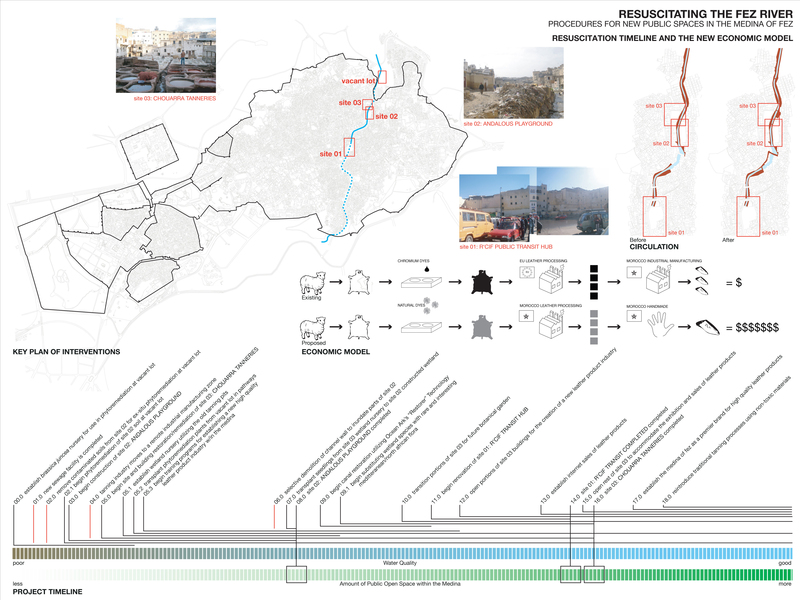 Aziza Chaouni now considers the core of the project’s vision has been implemented: the river has been resuscitated, both figuratively and literally. It is uncovered and acknowledged by all as a “river,” not a sewer. 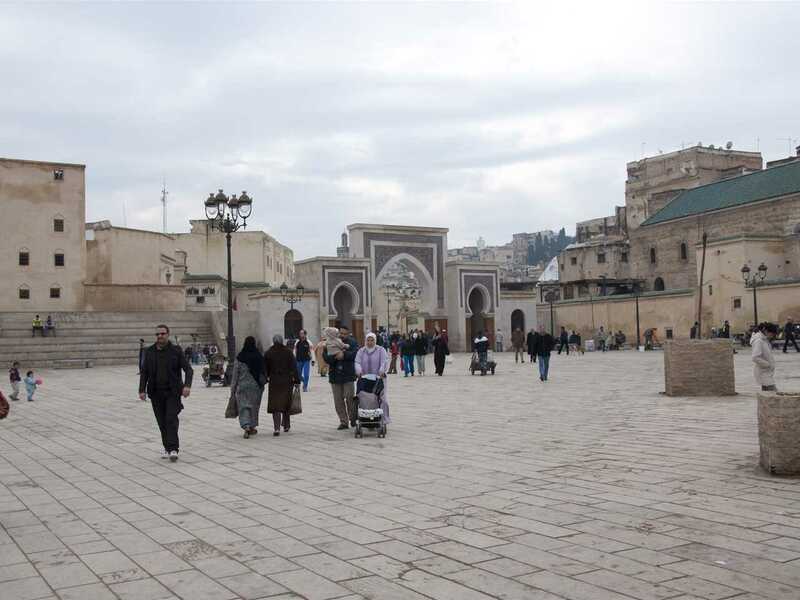 This presents a unique potential for the medina of Fez. 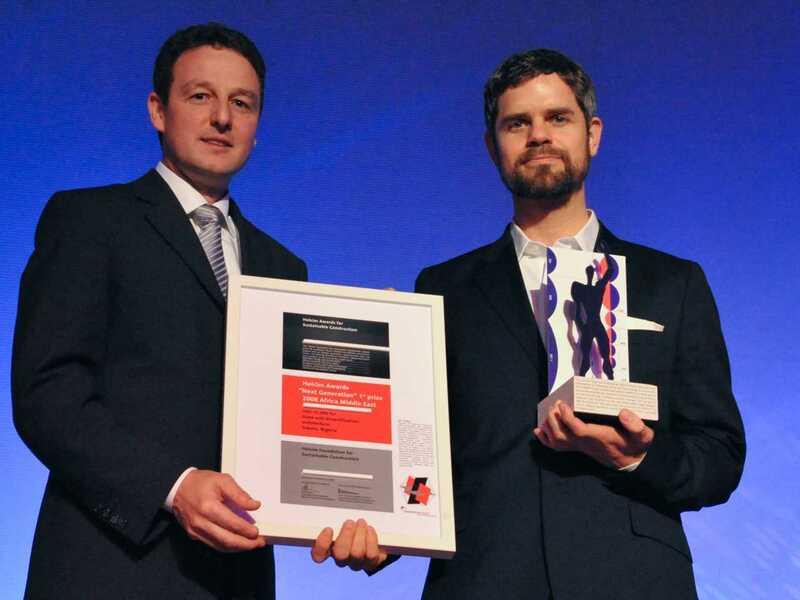 A key lesson we have learned is that a resilient design project, with a solid core idea, can surmount any changes that come its way. Its core idea will remain, even though its aesthetics, timeline, methodology will drastically change. In architecture school, we are taught that one’s project should be implemented as closely to one’s drawings as possible. In developing-world contexts, especially while working on municipal projects, this task is almost impossible. The architect needs to leave his or her ego in the back seat and develop a resilient, phased design with key principles that can sustain changes of stakeholders in the socio-political sphere, with the economic landscape and so on. Project update 2010 - "River remediation and urban development scheme, Fez, Morocco": The Fez urban development scheme is a multi-functional project that is centered upon the recovery of the river. Project update 2010 - "River remediation and urban development scheme, Fez, Morocco": Remediation work progresses with care to ensure the UNESCO World Heritage Site retains its structures and character. Project update 2010 - "River remediation and urban development scheme, Fez, Morocco": The northern part of the river Fez which was previously paved over has been uncovered. Project update 2010 - "River remediation and urban development scheme, Fez, Morocco": The “el-Rcif Plaza” melds the transportation hub and the river bank circulation system. 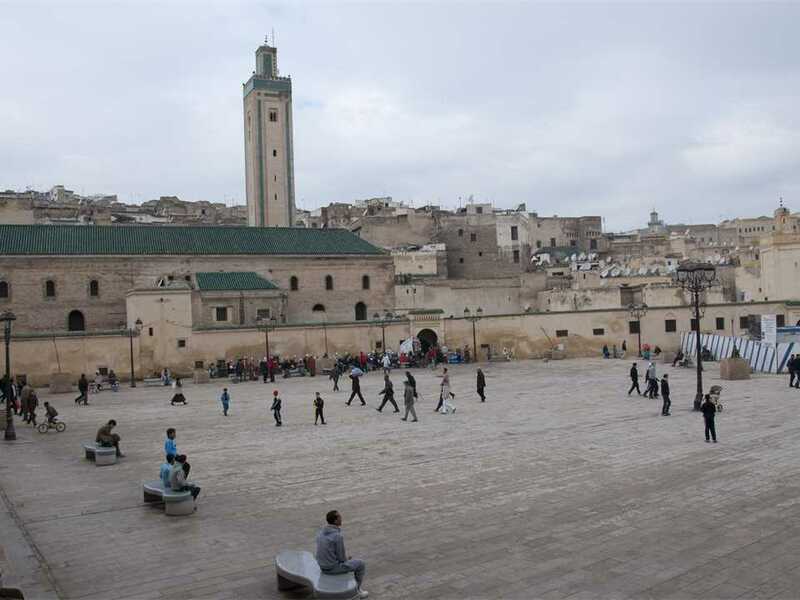 Alongside growing interest in the Holcim Awards competition that is currently open for entries – there has been groundbreaking progress at the site of the Global Holcim Awards Gold 2009 winning project in the UNESCO World Heritage listed old town of Fez, Morocco. One of the three precincts of the prize-winning River remediation and urban development scheme is nearing completion. 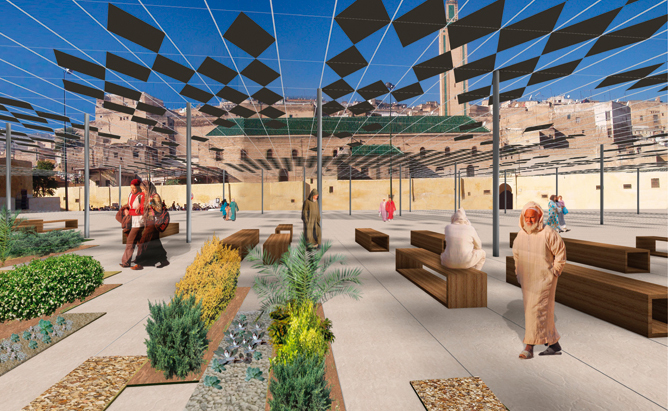 Beyond the progress in the “el Rcif Plaza”, as part of the Holcim Awards winning project, Fez is set to benefit from an additional competition for the design of “Place Lalla Yeddouna” which aims to bring a vibrant mixed-use urban hub for the community as well as visitors to the Medina. 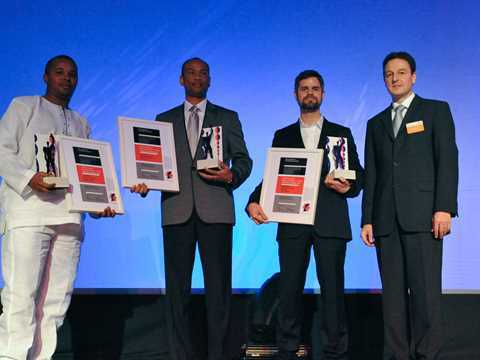 The competition seeks an urban and architectural design for an area of approximately 7,400sqm including the restoration of some existing buildings and the design of additional new buildings and public spaces. 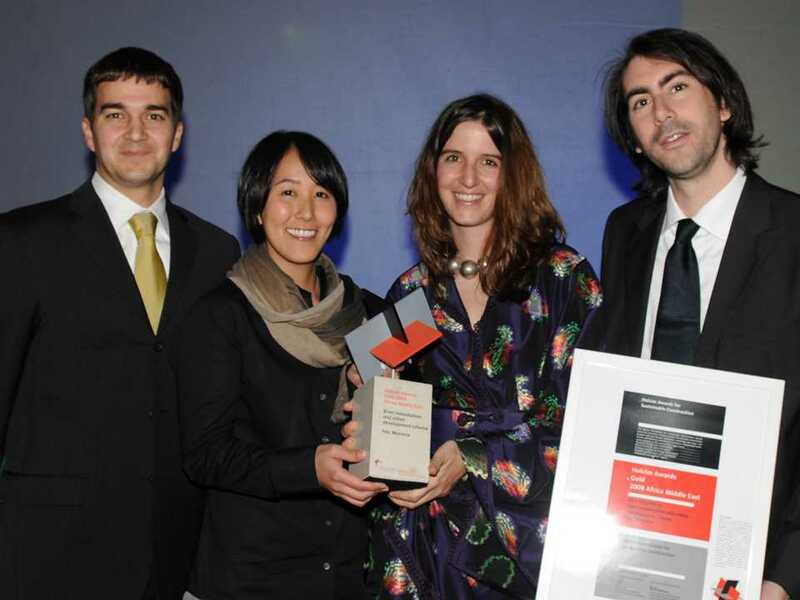 Aziza Chaouni and Takako Tajima, Principals of Bureau EAST won the second global Holcim Awards competition in 2009 with a multi-sited, multi-functional project that is centered upon the recovery of the river Fez. 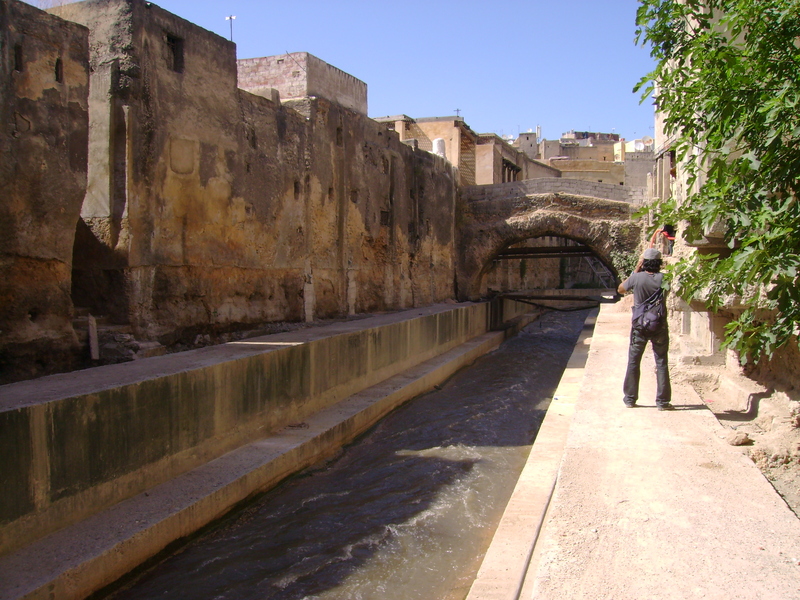 Work on restoration triggers a range of interventions in the Medina. One of the three precincts of the Award-winning project which will take advantage of vacant sites to reestablish a connection with the city fabric is also nearing completion. 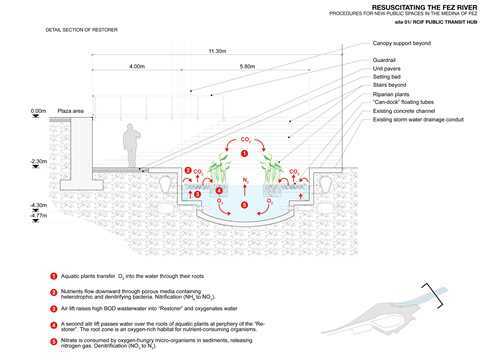 The “el-Rcif Plaza” melds the transportation hub and the river bank circulation system and allows for the cleaning of runoff water. The “el-Rcif Plaza” was previously cluttered with buses, taxis and informal parking – but is now a core of the pedestrian network. A larger parking facility has been constructed beyond the southern city walls of the Medina, and buses and taxis have been re-positioned. 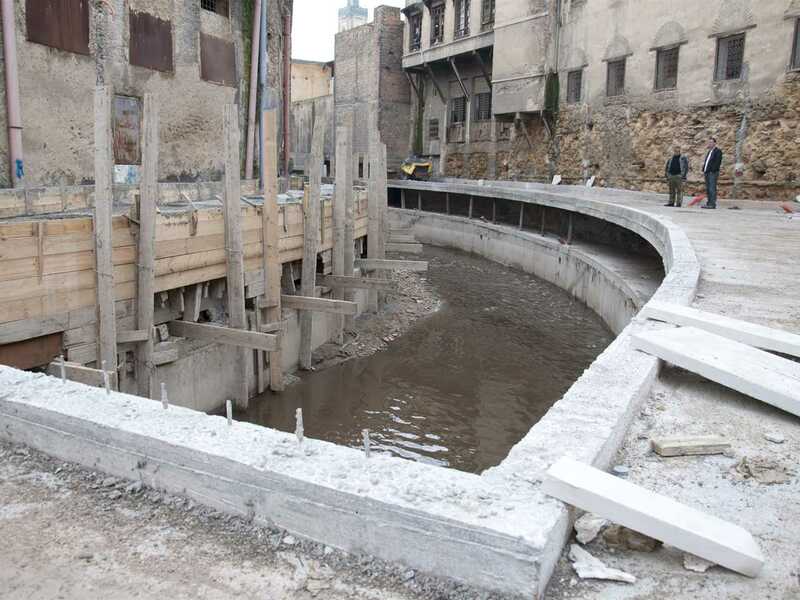 The next steps including urban furniture, canopies and benches, and rehabilitation of the river banks will mark the completion of the “el-Rcif Plaza” section of the project. The Medina of Fez continues to host new opportunities for sustainable urban development. The Agency of Partnership for Progress (APP), with its implementing partner, the Agency for the Development and Rehabilitation of the city of Fez (ADER-Fès), has announced a competition for the design of a site in the Medina of Fez, Morocco, known as Place Lalla Yeddouna. 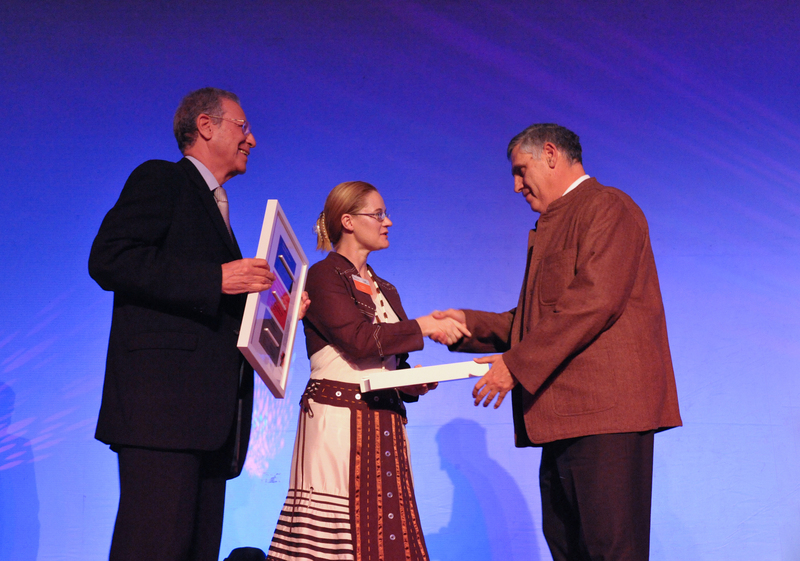 The competition is being conducted in the context of an international development program funded by the United States of America, acting through the Millennium Challenge Corporation (MCC), in accordance with the Millennium Challenge Compact (the “Compact”) signed on August 31, 2007, between the USA and the Kingdom of Morocco. 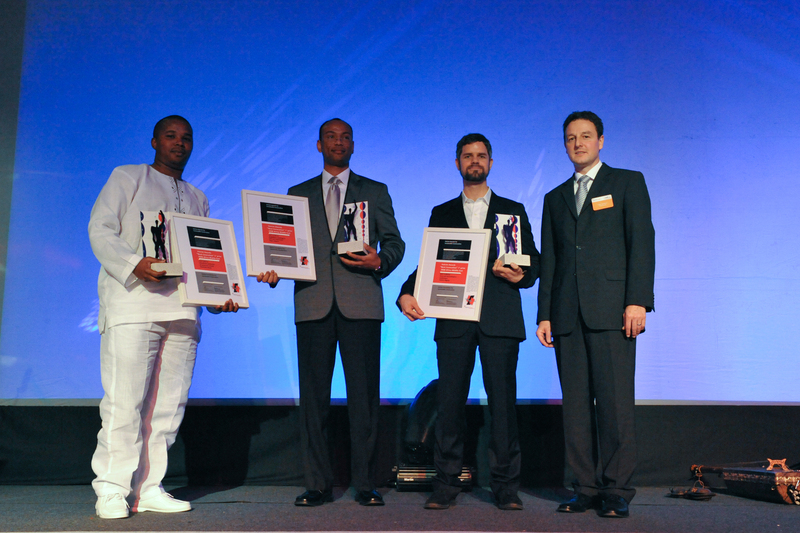 Registration for the competition remains open until October 15, 2010. The competition seeks an urban and architectural design for an area of approximately 7,400sqm, including the restoration of some existing buildings and the design of additional new buildings and public space. The competition will be conducted in two phases. 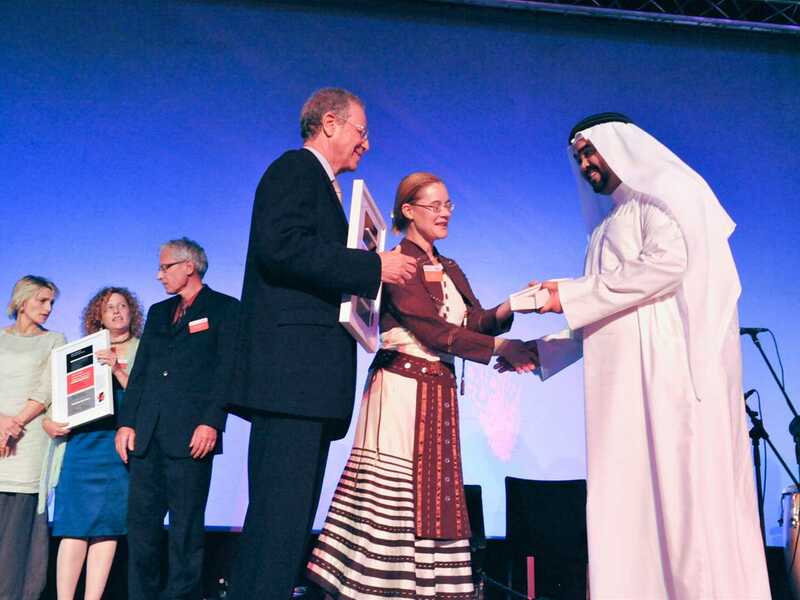 An international jury composed of renowned architects and official representatives of the Moroccan and US governments shall select eight participants for phase 2, who receive a fee of 40,000 USD each. Winners of the Global Holcim Awards Gold 2009 prize for project River remediation and urban development scheme, Fez, Morocco (l-r), Takako Tajima and Aziza Chaouni, co-founders, Bureau EAST, Morocco/Canada/USA. Members of the Global Holcim Awards Gold 2009 winning team (l-r): Nicko Elliott, Takako Tajima and Aziza Chaouni, Bureau EAST, Morocco/Canada/USA holding the Global Holcim Awards Gold trophy and prize certificate. 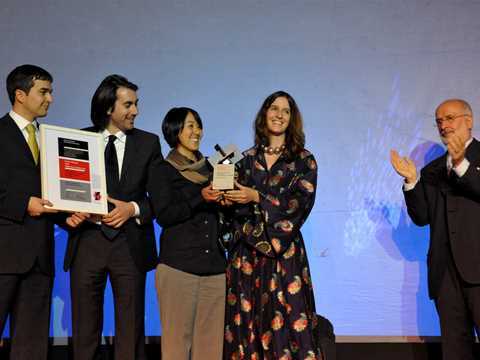 The icosahedron, a twelve-cornered polyhedron with an aspect ratio of the golden section, represents the objectives of the Holcim Awards because sustainability always strives for harmony – between today and tomorrow, between resources and consumption, and between needs and opportunities. 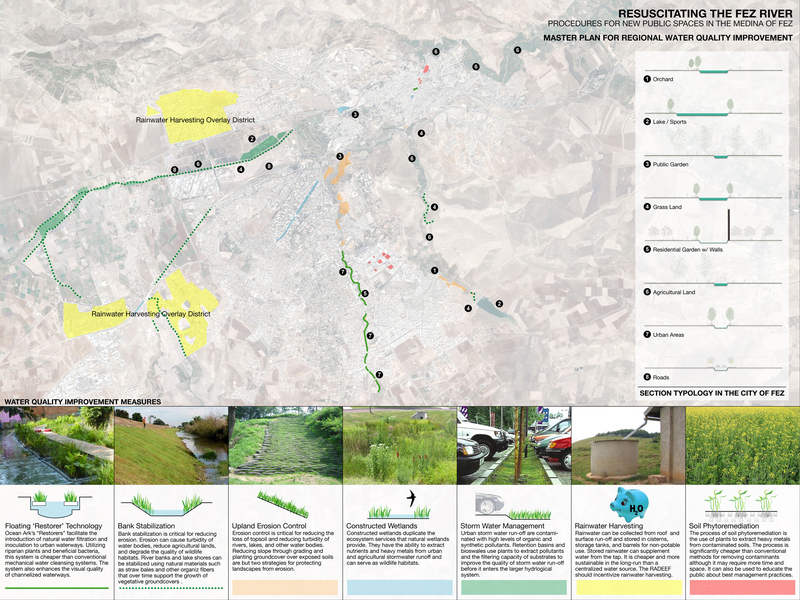 This is a multi-sited, multi-functional project that is centered upon the recovery of a river. 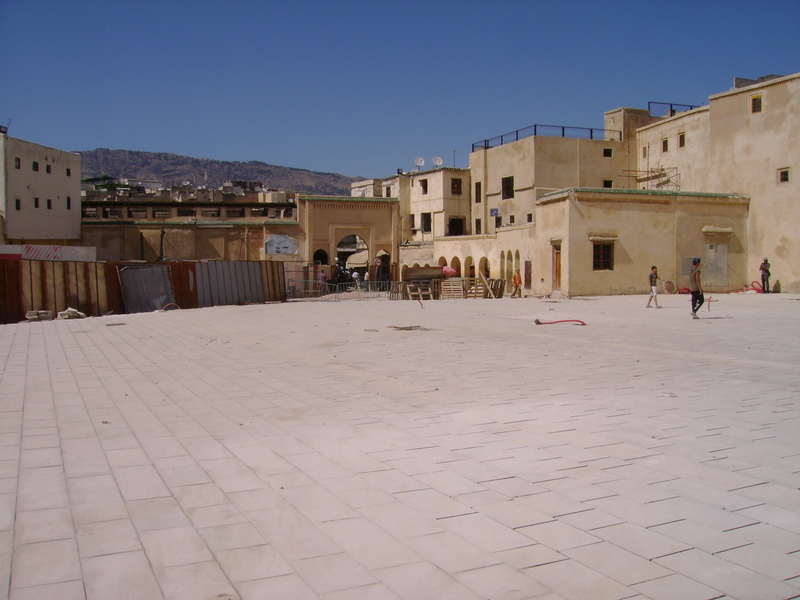 Work on restoring it triggers a range of interventions in the Medina. 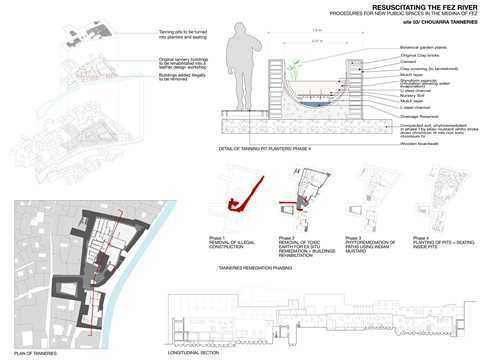 Outstanding features of this project are the strong emphasis on process and on the use of what is there. 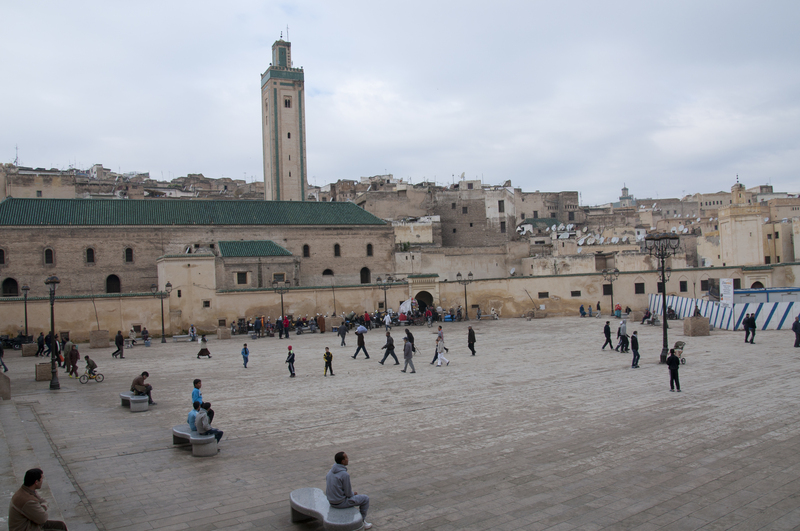 Core components are the rehabilitation of the old city’s architecture, revitalizing public spaces and traditional tanneries, and creating new pedestrian zones. 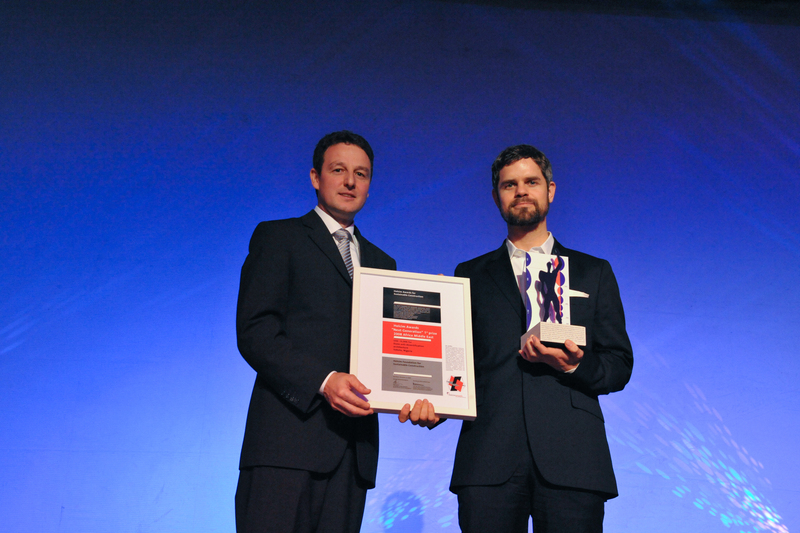 Each step in the project is part of a longer chain of recoveries, which also allows for future interventions. 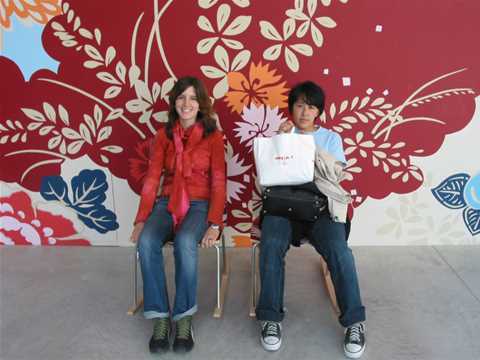 And it all starts with what is there now. 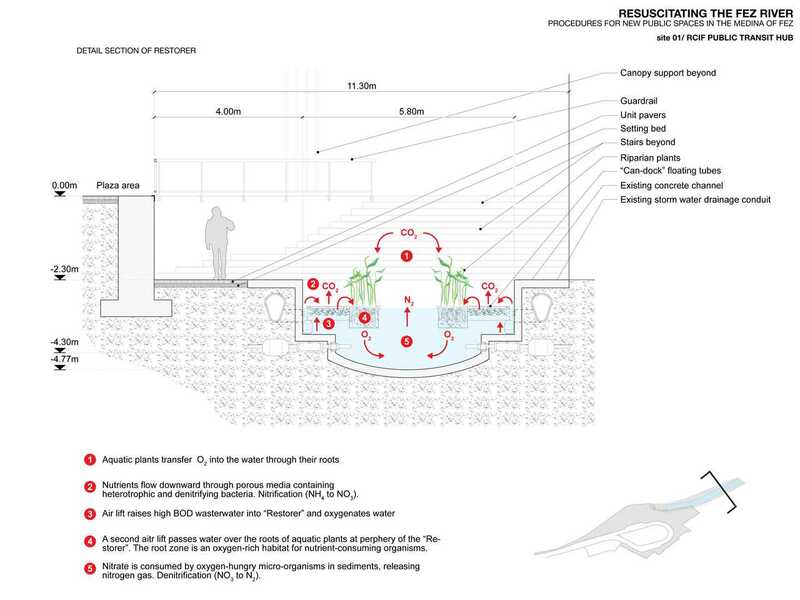 Recovery of the river is conceived of as an interactive process. 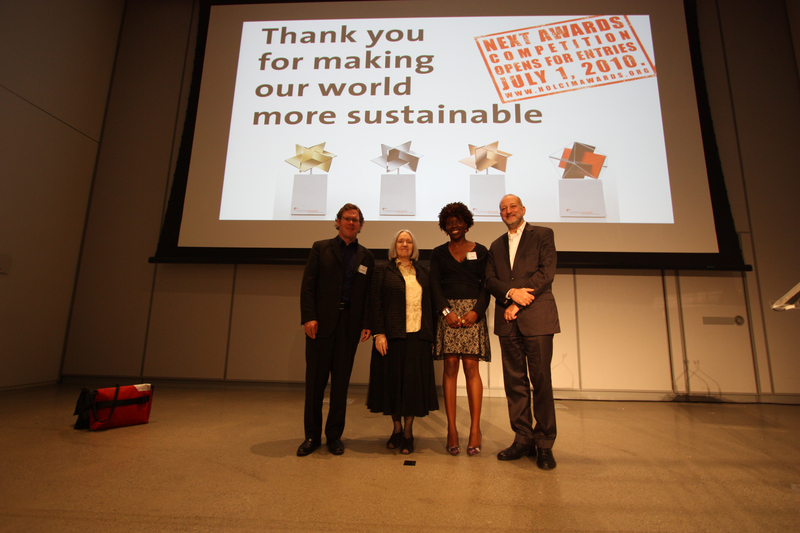 At one end, river recovery includes a return to original ecologies, notably promoting the growth of wetlands and biodiversity. At the other end, river recovery feeds into the rehabilitation of economic, social and civic activities: the potential for rehabilitating older craft industries, the sensitizing of the population to ecological issues and a clean city. 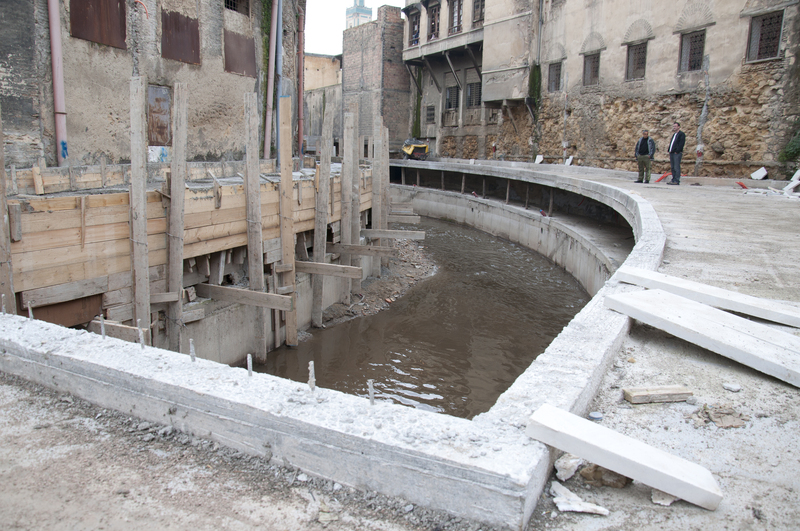 This is a phased project, with an initial phase of river recovery under way and the support of the city (urban government) of Fez. 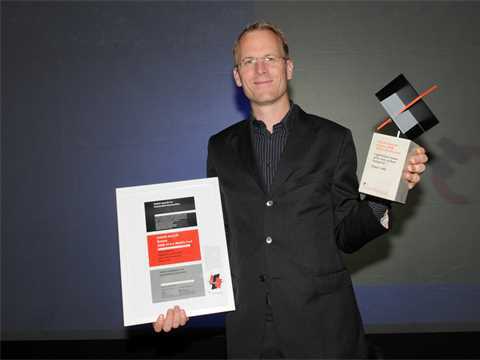 This phased approach opens up the project to the incorporation of further work. One critical aspect of further work that will have to be dealt with is the risk of flash floods that can surpass the absorption capacity of wetlands; there are simple and low-cost interventions that have been successful elsewhere. Given the open design of this project, such an addition should not be a problem: it would build on the river recovery work in process now. What marks this project is its wisdom: it works with what is there and uses it as a platform for upgrading and keeps the process open to future possibilities. 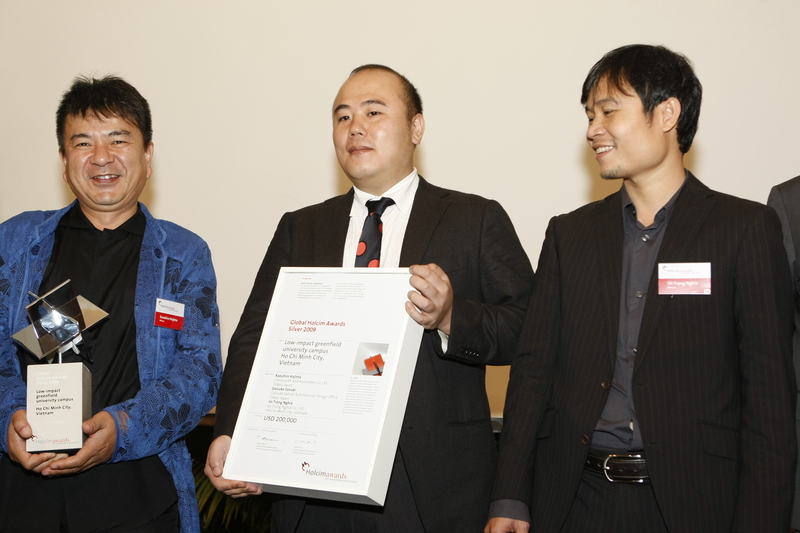 Hand-over presentation to the winners of the global Holcim Awards Bronze prize 2009 "Sustainable planning for a rural community, Beijing, China": (l-r): Li Yeqing, CEO of Huaxin Cement; Tom Clough, Member of the Executive Committee of Holcim Ltd; Rolf Soiron, Chairman of the Board of Directors of Holcim Ltd; and Zhang Yue, Associate Professor, Deputy Chair of Urban Planning Department, Tsinghua University Architecture School. 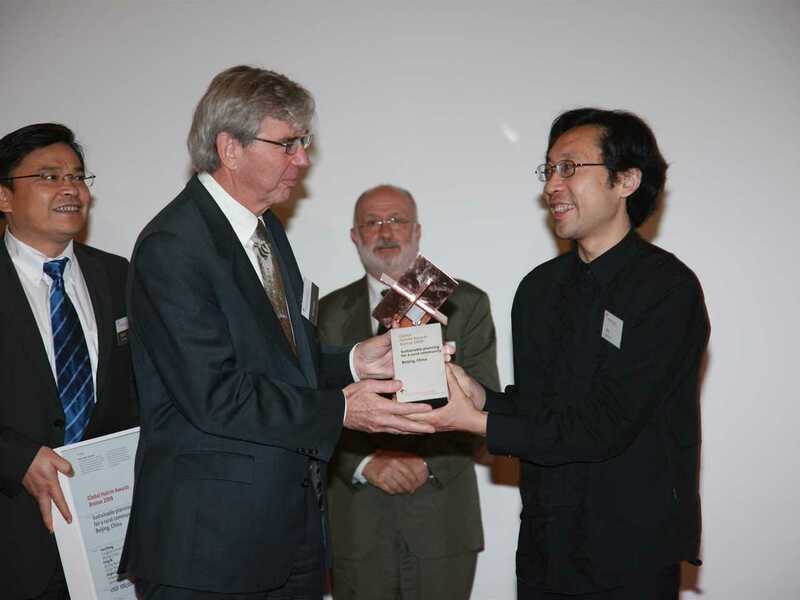 Members of the winning team for the "Low-impact greenfield university campus, Ho Chi Minh City, Vietnam" project (l-r): Kazuhiro Kojima, architect, Coelacanth and Associates Co., Ltd., Tokyo, Japan; Daisuke Sanuki, architect, Daisuke Sanuki Architectural Design Office, Tokyo, Japan; Vo Trong Nghia, architect, Vo Trong Nghia Co. Ltd, Ho Chi Minh City, Vietnam. 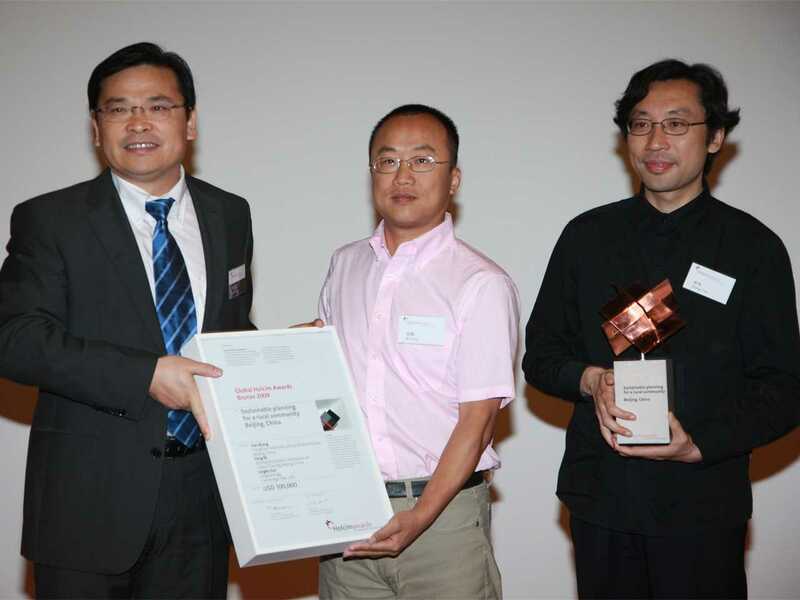 Global Holcim Awards Bronze prize 2009 hand-over "Sustainable planning for a rural community, Beijing, China": (l-r): Li Yeqing, CEO of Huaxin Cement congratulates winners Ni Feng, Senior Engineer, Beijing Municipal Commission of Urban Planning and Zhang Yue, Associate Professor, Deputy Chair of Urban Planning Department, Architecture School, Tsinghua University, China. 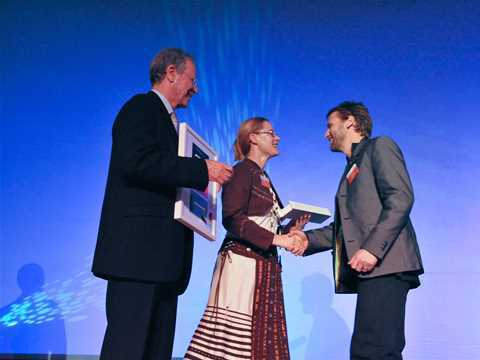 Winners of the Global Holcim Awards “Innovation” prize 2009 "Self-contained day labor station, San Francisco, USA": (l-r): John Petersen, “Innovation” prize winner, Public Architecture, San Francisco; Saskia Sassen, Robert S. Lynd Professor of Sociology, Columbia University, New York, and member of the global jury; Liz Ogbu, “Innovation” prize winner, Public Architecture, San Francisco; and Enrique Norten, Principal and founder, TEN Arquitectos , Mexico City and New York, and member of the global jury. 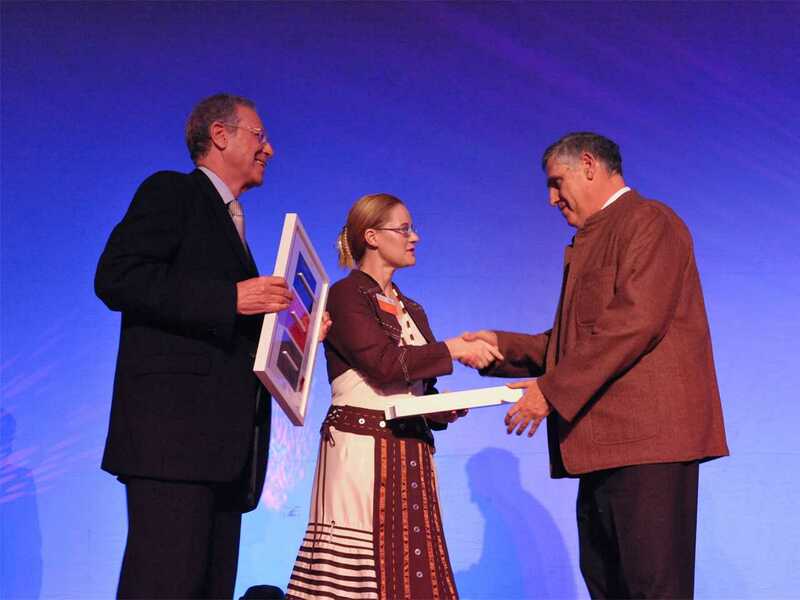 A project centered upon restoration of the river through the UNESCO World Heritage listed Medina of Fez was awarded the top prize of USD 300,000 and the Global Holcim Awards Gold. A youthful and international project team led by architect Aziza Chaouni (Morocco) and urban planner Takako Tajima (USA) are remediating the heavily-polluted river Fez to revitalize the ancient heart of the city. The approach includes a series of interventions to renovate traditional tanneries, create public spaces and pedestrian zones, and restore wetlands as well as biodiversity. 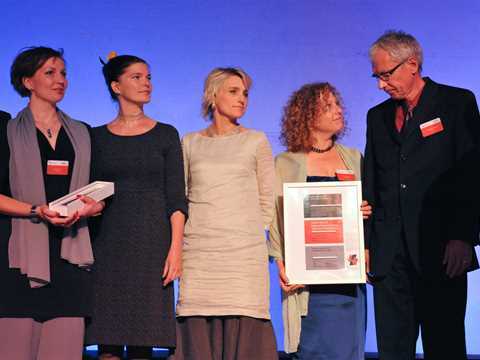 The jury applauded the scheme for creating a chain of recovery projects to enable future sub-projects to be added – and for addressing the economic and social life of the city together with the ecology of the river. “This is a multi-sited, multi-functional project organized around the recovery of the river. Core components rehabilitate the architecture of this historic Medina, creating a functional and viable urban precinct,” stated the jury report. 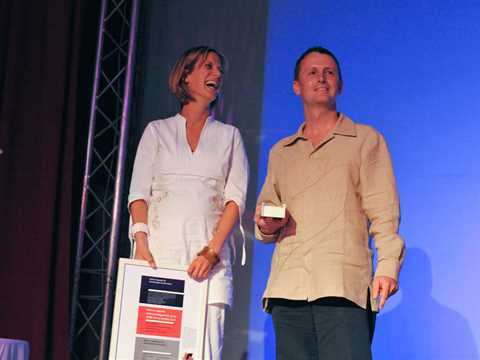 The project authors formed NGO Sauvons Oued Fez (Save the Fez River) after winning the regional Holcim Awards Gold 2008 Africa Middle East. 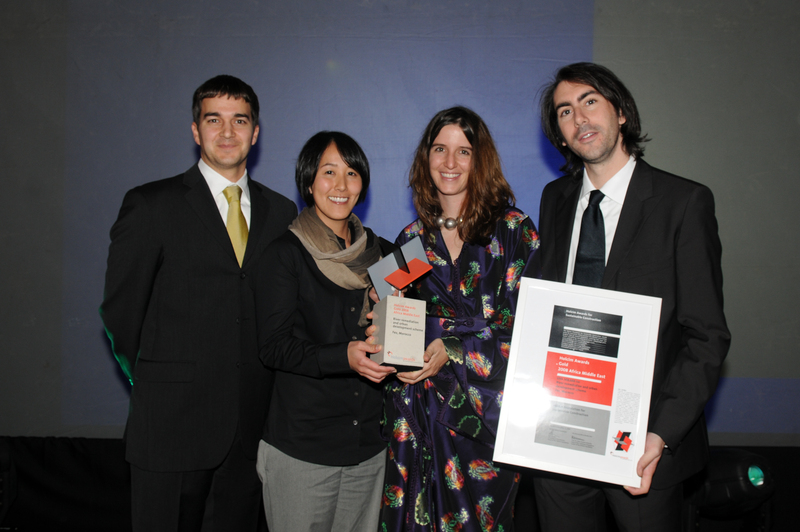 The NGO is a network to advance the sub-projects of the remediation and encourage community involvement. 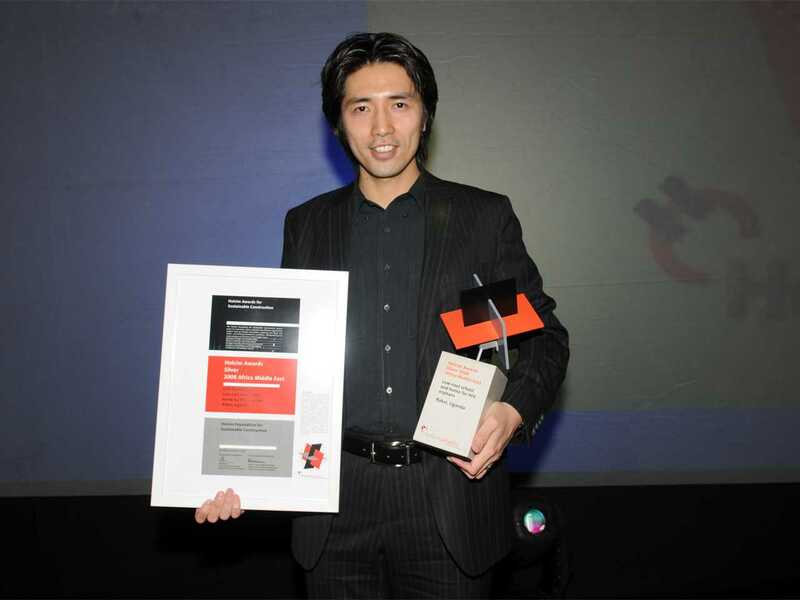 Holcim Awards Silver winner, Koji Tsutsui, architect, Koji Tsutsui Architect & Associates, Tokyo, Japan for "Low-cost school and home for HIV orphans, Rakai, Uganda"
Holcim Awards Bronze winner, Shaun Killa, architect, Atkins PLC, Dubai, UAE for "Lighthouse tower with low-carbon footprint, Dubai, UAE"
(l-r): Jury members Rachid Benmokhtar Benabdellah and Nina Maritz present a Holcim Awards Acknowledgement prize 2008 for "Stabilized earth visitors’ center, Mapungubwe National Park, South Africa" to Peter Rich. 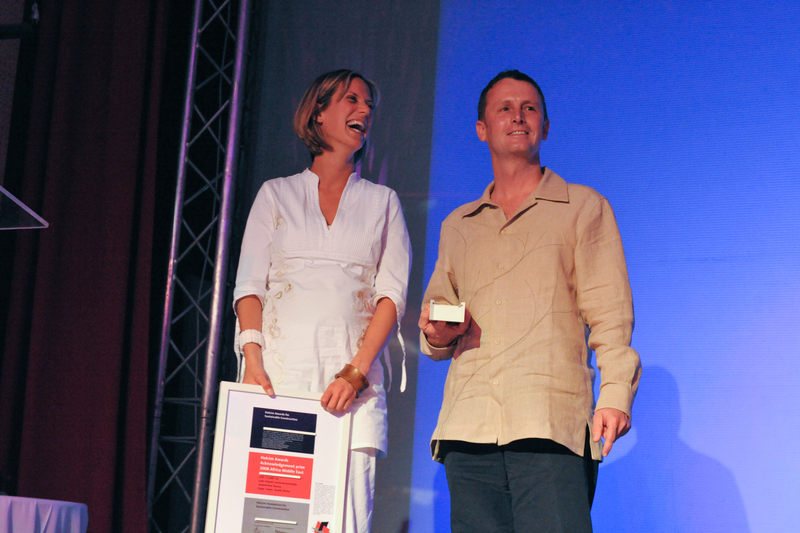 Holcim Awards Acknowledgement prize 2008 Africa Middle East winners: (l-r) Rachid Benmokthar Benabdellah and Nina Maritz congratulating Steve Kinsler. 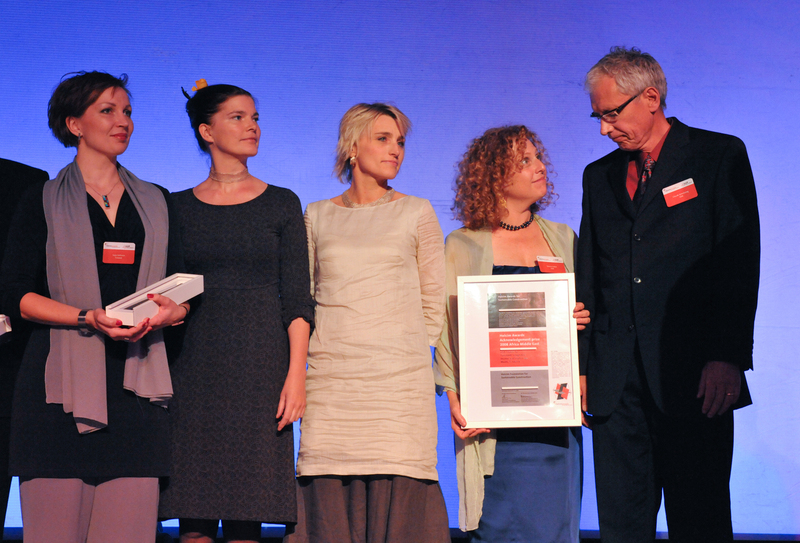 Holcim Awards Acknowledgement prize 2008 Africa Middle East: (l-r) Saija Hollmén, Jenni Reuter, Helena Sandman, Donna Cohen and Claude Armstrong. 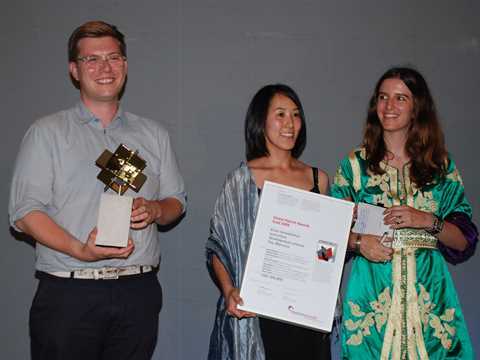 A remediation and urban development scheme for the river precinct in Fez, Morocco received the top prize of USD 100,000 and the Holcim Awards Gold 2008 trophy for combining a comprehensive socio-cultural and economic program within the core environmental remediation initiative. 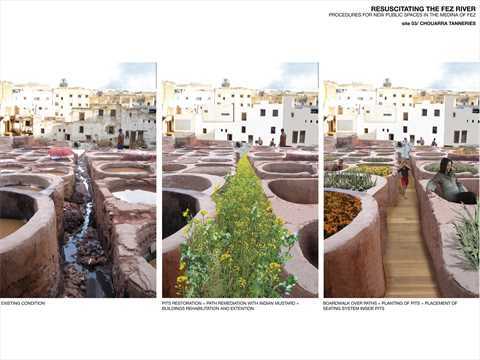 The landscape design by Moroccan architect Aziza Chaouni and American-resident Japanese planner Takako Tajima includes water quality improvement, remediation of contaminated sites, creation of open spaces and the enhancement of existing resources for economic development. Head of Jury and acclaimed architect Joe Addo, praised the approach of coupling environmental remediation with a comprehensive socio-cultural and economic program. 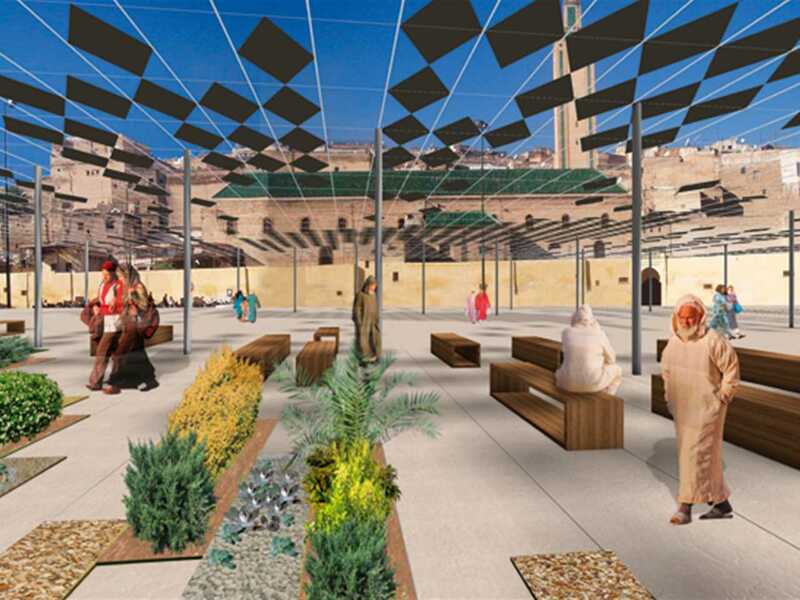 “While mitigating the threats of pollution and declining water supply to this historic lifeline traversing the medina of Fez, community-supported programs such as a leather craft center, recreation facilities, water-cleaning wetlands and botanical gardens will restore vitality to the city in a truly sustainable way,” he said. Resuscitating the Fez River – chouarra tanneries pits restoration + path remediation with Indian mustard + buildings rehabilitation and extension. The pre-eminent feature of this project consists of the comprehensive approach to environmental revitalization and urban renewal. The Fez River, a historic lifeline traversing the medina of Fez, is now faced with a diminished role due to serious pollution and risks drying up. The future water-diversion to a new sewage treatment plant allows the mostly covered river to be laid open again and thus regain its potential as a public amenity. The project proposes interventions at city-scale master plan and site-scale projects for cleaning the degraded water as well as the remediation of heavily polluted sites such as the tannery at Chouarra. 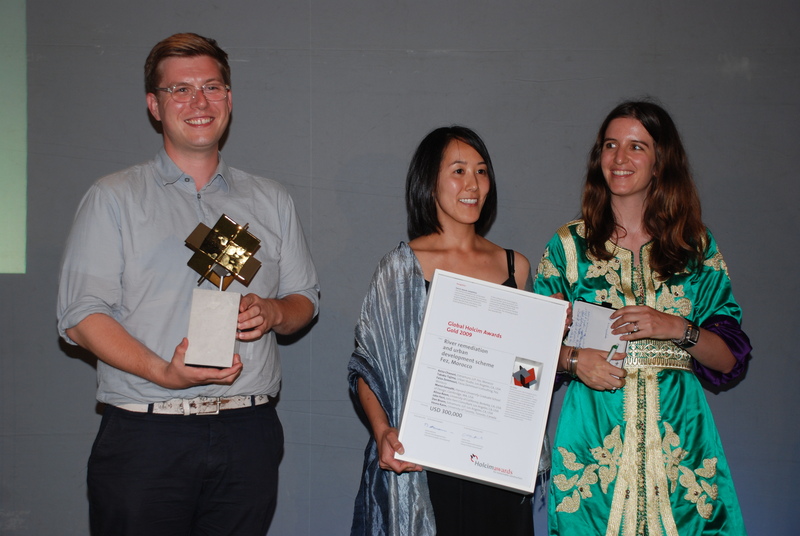 The jury commended this project because of the coupling of a comprehensive socio-cultural and economic program to an environmental remediation initiative. In particular, once implemented, the proposal has the potential to restore the vitality of the city of Fez for its residents and visitors by mitigating the two major threats now facing the river. 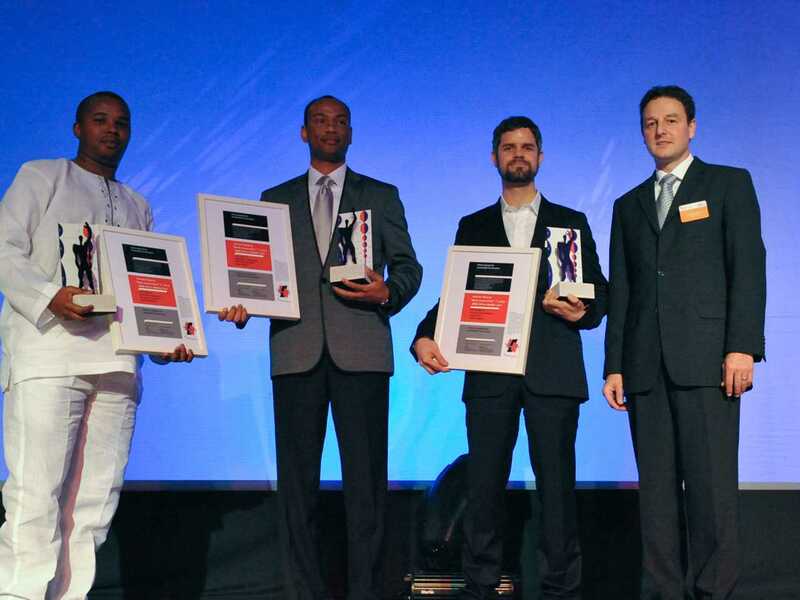 Equally, the proposed transformation of existing nuisances through community supported programs such as a leather-craft center, recreation facilities for children, water-cleaning wetlands and botanical gardens is highly commended. 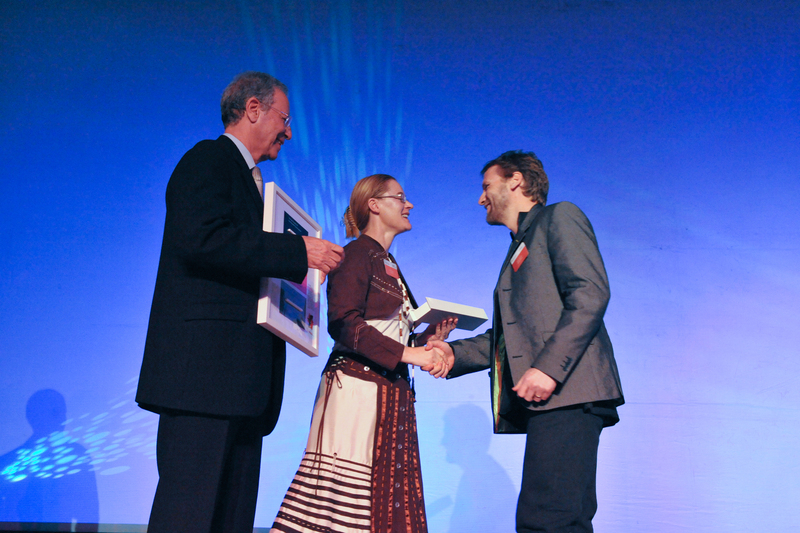 The project promises to be a strategic environmental intervention creating a myriad of social beneﬁts. The medina of the Moroccan royal city of Fez is a UNESCO World Heritage Site. 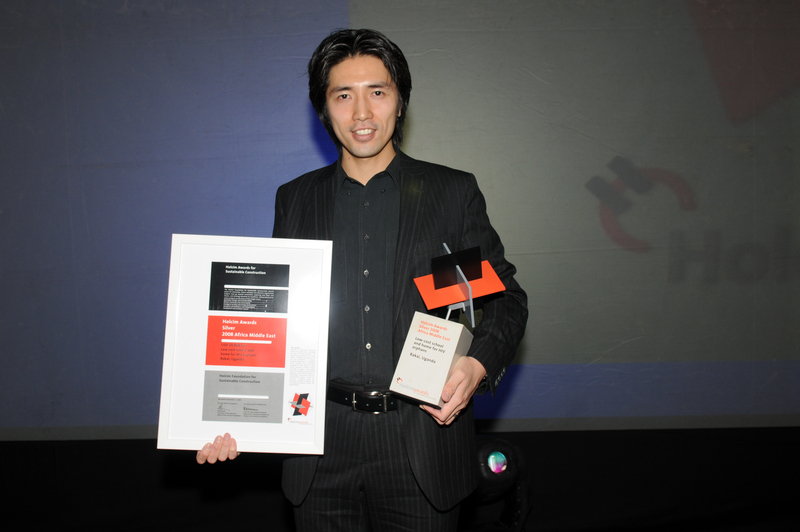 However its continuing decline threatens this prestigious title. The project, River remediation and urban development scheme, aims to revitalize the heavily polluted and neglected river Fez. By returning to this ancient heart its dynamic soul, urban renewal and life quality will follow.